The Aeolian-Vocalion was created by the Aeolian Piano Company in 1916. The Piano company produced, besides pianos, phonographs. Having a record label was the natural extension. In Aug. 1920 Aeolian introduced reddish-orange pressings. In 1921 the title-label “Aeolian-Vocalion” was replaced by just the a “Vocalion” title-label in a black and gold color scheme. Acquired by Brunswick Records in 1925, Brunswick would keep the black and gold color scheme and add the phrase “Brunswick Record Corporation” at the bottom. American Record Company (ARC) would acquire leasing rights to Brunswick Records (including Vocalion) in late 1935 and create a glossy black design. It would stay that way until 1937 when the label turned a bright blue. The bright blue label would last until 1940 until Vocalion was acquired by Columbia Broadcasting System (CBS) and discontinued. The Vocalion catalog was then re-leased under the CBS name. Delta Blues singer Robert Johnson first recorded on the Vocalion label in 1936-1937. The Aeolian-Vocalion recording studio was located at Aeolian Hall in New York. There were pressing plants in New York and Meridan, Connecticut. Music Genres: Race-Records, Blues, Specialties, Swing, Country, Western-swing. Pre-1941 Label: Some are in black shellac and some are in reddish-brownish shellac. Aeolian-Vocalion Record Label: 1916-1920. This record is pressed in black. Tiger Rag by the Original Dixieland Jass Band, was first released on the label. Record Label: 1916-1920. Label colors: Tan, Gold, Black. Aeolian-Vocalion Record Label: 1920. Pressed in red. 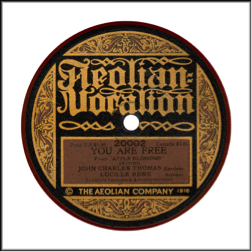 The song title “You are Free: From Apple Blossoms” is recorded by John Charles Thomas who was a baritone with a “beautiful voice”. Though, Fritz Kreisler and Viktor Jacobi initially wrote the song. Record Label: Aug. 1920. Red Record color. “The Profiteering Blues” written by Irving Bibo and sung by Bill Murray. Bill Murray was an early 20th century singer and entertainer. Aeolian-Vocalion Record Label: In 1921, the label drops “Aeolian-Vocalion” in favor of just “Vocalion”. When it was bought by Brunswick Records in Nov. 1924, a phrase of “Brunswick Record Corporation” is added at the bottom. Record Label: 1925-1935 Black and Gold scroll. Note “Brunswick Record Corporation” at the bottom. Aeolian-Vocalion Record Label: In the mid-1930s, Brunswick redesigns the label to have a glossy black finish with the label name, artist, and other record information in a scroll-like shape. The song in this label, “In That Vine Covered Chapel (In the Valley)” was sung by Lee O’Daniel and his Hillbilly Boys. The group is an example of western-swing. Record Label: 1935-1937. Glossy black. Aeolian-Vocalion Record Label: Late 1930s, the label goes to a Blue and Tan color scheme. Record Label: 1937-1940. Bright blue label. Notes: #1000 is the race-record series. The Hoosier Hot Shots, a string quartet band known for there unusual instruments, also recorded on the label. –Aeolian-Vocalion Discography : For a complete discography see “Vocalion” at the bottom.